Ride the Vote: June 5, 2018! We asked candidates their thoughts on some of the many urgent transit issues facing San Francisco, and we got responses from almost all mayoral candidates (except one), and all District 8 candidates. We want you to know where your candidates stand on transit, which is one of the most pressing issues in San Francisco (next to perhaps housing and homelessness, more symptoms of a region bursting at the seams). The mayor of San Francisco appoints the seven-member Board of the SFMTA, which oversees the agencies budget and priorities. That same board also appoints the Director of Transportation. In other words, the mayor has a lot of control over the Transit First agenda. So make sure you’re registered to vote! Also: make sure you vote yes on RM3! Possibly the most important thing to vote for is RM3, or Regional Measure 3. This is one of those once-in-a-generation opportunities to fund crucial regional transit infrastructure. RM3 comes, interestingly enough, after RM1 and RM2, which were also regional bridge tolls. RM3 is a bridge toll increase of $3 phased in over a few years. This money will go to all sorts of awesome public transit infrastructure for the whole region. RM3 provides funding for more Muni vehicles, BART vehicles, starting to plan for the second Transbay Tube, doubling ferry service, Bay Bridge transit lanes, and Clipper 2 funding. 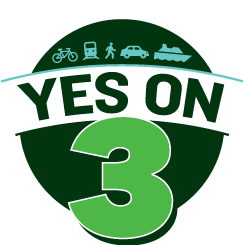 So make sure you — and all your friends in the nine-county Bay Area — Vote Yes On RM3.